The art of apologizing is not easy. It doesn’t come naturally to most of us, but we can learn it. And it’s worth the effort. We all make mistakes. The question is, what do we do after we’ve made a mistake? A true apology can bring closure to tensions, conflicts, and hurt feelings that have been sore spots for months, even years. It can break down barriers faster than any other words or actions can. Apologies must be sincere. Anyone can tell when an apology is obligatory, forced, or fake. 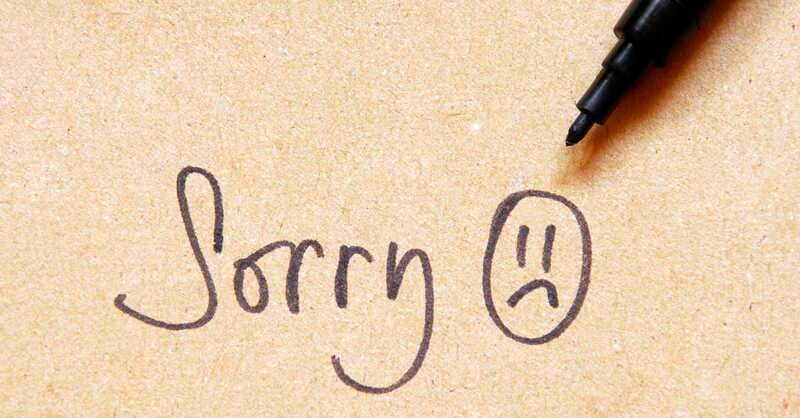 Let’s practice the language of genuine apologies. Lead off with these two words. No “buts.” Words of sincere regret need to stand alone. Never add the word but. (“I’m sorry I said all those mean things to you, but you were irritating me.”) That shifts the blame to the other person. That’s not an apology; it’s an attack. Why is it so hard for some of us to admit, “I was wrong”? As if being wrong means we’re weak? Too o en we rationalize. Justify. Gloss over what we did and focus on why. Blame others. That totally undermines an apology. For many people, those three words, “I was wrong,” really communicate that an apology is sincere. If you lost your sister’s iPhone—buy her a new one. If you ditched your friend on Friday night—hang out on Saturday. If you lied to your coach—go tell him the truth. For some wrong actions, there’s an obvious remedy. The idea of restitution, or making things right, is deeply embedded in our human psyche. We all have an internal scale of fairness, and when things have been o -balance, we want to make them even again. Knowing the love languages of your tribe can help you restore jus- tice and love in a relationship. You can express restitution in the other person’s primary love language. For Words people, tell them how incredible they are and how much they mean to you, in conjunction with your apology. For Service people, prove you’re sincere by doing something for them, such as cleaning out their car, doing their laundry, or mowing the lawn. For Gifts people, give something that shows you were thinking of them and that communicates “I’m sorry” deeply. For Time people, give your undivided attention while you apologize. For Touch people, an apology without physical contact feels insincere, so bridge the physical distance between you and give them a hug. Speaking an apology in someone’s love language communicates that you genuinely care about the person. Now there are some hurts you just can’t make right. Restitution is impossible. That changes the question from “How can I make this right?” to “How can I show you I still love you?” If you betray your best friend, or publicly humiliate your dad, or cheat on your girl- friend, you can’t exactly make that right. But in the context of your apology, you can communicate that you love the person. The technical term for this is “repentance.” Repent means to turn around or change one’s mind. It’s choosing to make a change. What Abby is looking for (besides a new boyfriend) is repentance, not a 5,000th apology. True repentance begins in the heart. We realize that we’ve hurt someone we love. We don’t want to continue hurting the person and decide to change. We verbalize that decision to the person o ended. We don’t minimize our behavior but accept full responsibility for our actions. What people who have been hurt want to know is, “Do you intend to change, or will this happen again next week?” The answer to that question depends on repentance. • It indicates that you want to see the relationship restored. • It shows that you realize you did something wrong. • It gives the offended person a measure of control. You can’t force other people to forgive; they have to choose. The future of your relationship depends on the other person’s decision. That helps restore the balance of power in the relationship. If you want healthy relationships, then you need to learn the art of apologies. You’ll need to become fluent in those five key phrases and add a big dollop of sincerity.